Milan is, to my mind, a pretty easy city to navigate – partly because the historic center, where nearly all the tourist attractions are located, is relatively compact and walkable. Having said that, it also has a great network of public transportation options that are easy to make use of if you get tired of walking everywhere or if you want to get outside the area immediately around the Duomo. 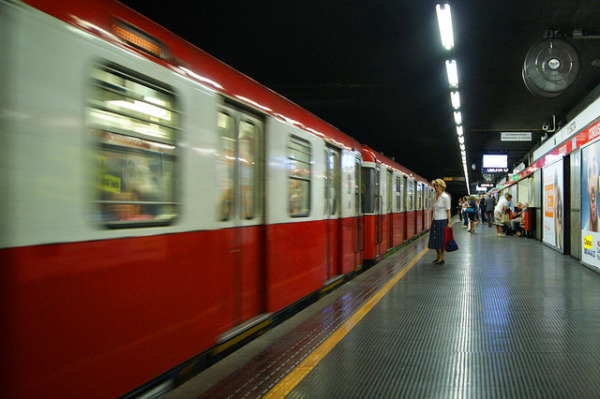 Here’s an overview of the modes of public transportation available in Milan. As is the case with many other cities, Milan’s public transit methods use the same ticket system, which is hugely convenient. As an aside, the company that operates public transportation in Milan goes by the acronym ATM, so you’ll see that on signs that have to do with transit tickets or transit offices (contrary to what you might think at first, ATM does not indicate a bank machine in Italy). Each ticket, which can be used on the Metro, tram, and buses in Milan, costs €1.50 and is valid for 90 minutes. You’re allowed to ride as many buses and trams within that 90-minute window as you like. You can also change trains on one Metro journey using one ticket. Once you’ve used a ticket for the Metro, however, you can’t use it for another Metro trip within that 90-minute validity period. You can leave a Metro station and then ride buses and trams for the remainder of the ticket’s usefulness. If you’re going to be riding Milan’s public transportation more than once or twice, you can get what’s called a “carnet,” which is the equivalent of 10 tickets, for €13.80. Those of you who have been to France may recognize the term “carnet” – it’s borrowed from the French, and is pronounced the same way in Italy: kar|NEH. These can’t be used simultaneously by more than one passenger – so each traveler in your group must have his or her own ticket or carnet. Don’t forget that with any ticket, you must validate it upon first use. On the Metro, that means inserting the ticket into the gates in order to get into the station. On trams and buses, that means finding the validation machine on board the bus and stamping your ticket when you get on. With each of the tickets mentioned so far, children under the age of 10 (up to two per paying adult) are allowed to ride for free. The ATM website also lists something called a “Luggage Ticket,” at €1.50 per piece of luggage, for use on public transit within the city of Milan. I’ve never bought one, but I typically get as far as a train station with my luggage and then take a taxi to my accommodation. If you’re traveling on the Metro, bus, or tram with luggage, it’s probably a good idea to have a Luggage Ticket with you just in case. Also note that the above prices are only for what are called “Urban Tickets,” which is a geographic designation covering the city center of Milan. If you plan to go to the Rho Fiera trade show fairgrounds area, that’s outside the city center and is therefore a different ticket. Those are “Fiera Milano Tickets,” and those are €5 round-trip or €8 for a one-day pass (good if you plan to go back and forth several times in one day). In addition to buying tickets in Metro stations – either at ticket windows or automated machines – you can buy ATM tickets at tobacco shops, news stands, and some bars throughout Milan. This page on the ATM site explains all the ticket options available, as well as how to validate them. When given the choice, the Metro is always my favorite way of getting around a city. In Milan, that’s no different. There are four Metro lines in Milan – M1 (red), M2 (green), (M3 (yellow), and M5 (lilac or light gray). Part of the M5 is currently under construction, set to be finished this year, and a fifth line is scheduled to extent to Linate Airport by 2020. The Milan Metro is navigated the same way as the subways in Paris and Washington D.C. (among others), with directions named for the end station on each line. Note that some lines split at a certain point, so pay attention to which train you board if your destination is past the fork in the road. For whatever reason, the hours when the Metro runs are imprecisely listed on the official ATM website – it actually says that the Metro runs from “about” 06:00 until “about” 00:30 – except on December 25 and May 1, when it operates from 07:00-19:30. Trains typically arrive every 2-8 minutes during peak travel times, a little less frequently later in the evenings and on weekends. 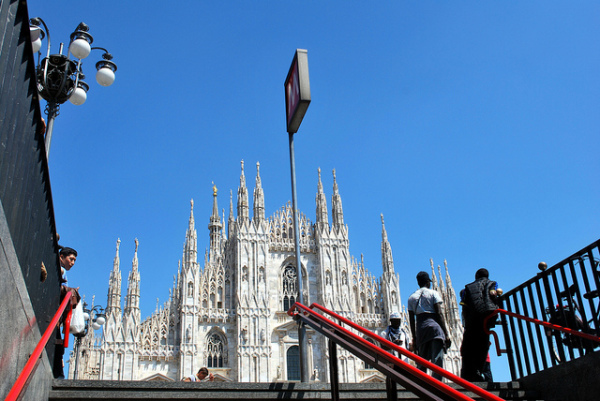 Metro stops in Milan are indicated by big M signs near staircases leading to underground stations, and there are plenty of stops within the historic center – including at the Duomo, Centrale Station, and Cadorna Station. For a network map of the Metro lines (plus the suburban railways), click on the image icon under the heading “Pictures” on this page. It’s not really large enough to navigate by, however, so I’d suggest picking up a Metro map when you get to Milan – they’re available for free at the ATM Point offices in many major Metro stations. 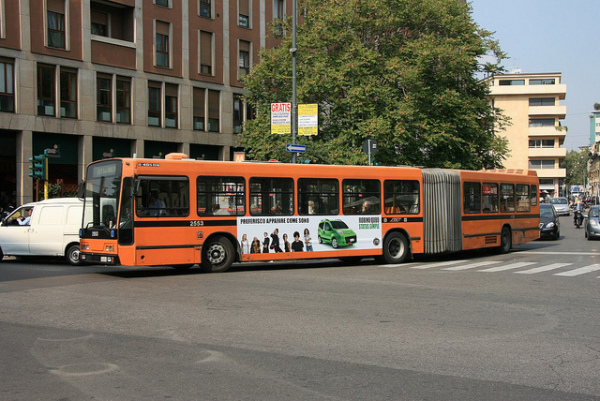 The bus network in Milan is more than 80 lines strong, and it covers ground that the Metro does not. The bus lines have both numbers and names, with the names indicating which direction the bus is traveling (akin to the Metro lines). Bus stops in Milan tend to consist of no more than a metal pole with a small placard showing numbers for the buses that stop there, as well as a list of stops on each line. The stop at which you are standing is highlighted or outlined, with the stops below being the ones coming up. If your intended destination is above the highlighted name, you need to find the corresponding stop on the opposite side of the street. Buses will only stop if there are passengers waiting to board (or someone on board who wants to get off), so when you see the bus you want approaching, step toward the curb and put your hand up (like you’re hailing a taxi) – the latter is especially important if there are multiple buses serving one stop, as the driver won’t necessarily know you’re not waiting for a different line. Once on board, indicate you want to get off at the next stop by pushing one of the buttons near your seat. Buses begin running between 05:30-06:00 and run until between 00:30-01:45, depending on the line. There are some routes which also have night buses, operating from about 02:00 until 06:00 on peak days (usually weekends). Remember to validate your ticket upon boarding the bus. There are only 17 tram lines in Milan, but they serve some areas that even buses don’t. 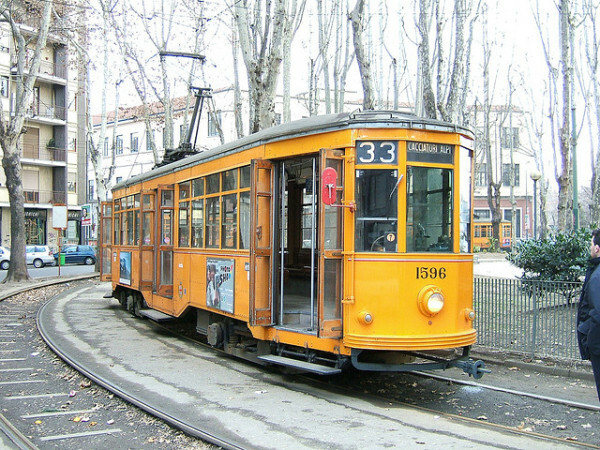 (And, personally, I just love riding trams, so I try to take them in Milan even when a bus would get me there.) There are some historic trams still in operation from the 1920s, and lots of newer ones. Nostalgia makes me love the old ones – especially the old wooden benches inside – but the newer trams are more spacious and usually better air-conditioned. Trams and buses are part of the same numbering system, with trams getting the lower numbers and buses getting the higher numbers. There are some exceptions, of course, but generally speaking if you’re looking at a transit map and it says the closest stop to you is numbered 1-33, it’s probably a tram. Line 18 is a notable exception – that’s a bus. Riders can treat trams as they would buses in a few ways. Trams only stop when there’s someone waiting at a station, or someone on board wants to get off, so to indicate that you want to get on you’ll need to step closer to the curb as the tram approaches or even raise your hand a bit. Also, you need to validate your ticket upon boarding the tram. Once on board, indicate you want to get off by pushing a button or pulling a cord. It’s also worth noting that there is sometimes a car lane between tram lanes and the sidewalk, so look both ways when disembarking. The first thing to know about taking taxis in Milan is that you can’t hail one the way you would in New York City. 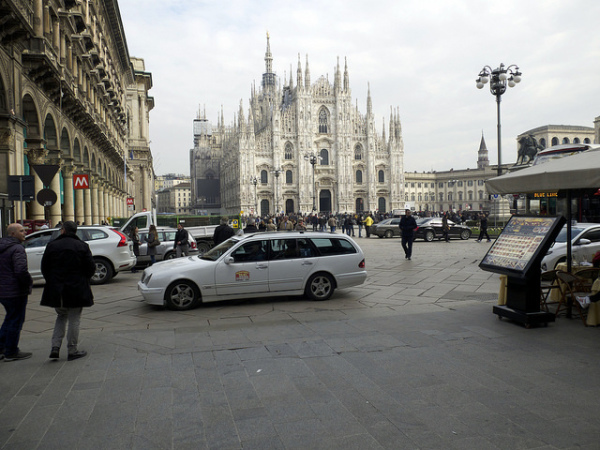 Taxis aren’t allowed to stop for passengers just anywhere – there are specific taxi stands all over Milan, and you have to go there to get a cab. What’s more, in not-so-busy areas or off-hours, there won’t be a queue of taxis waiting at the stand – there will just be a phone that connects directly to a taxi dispatch service. For non-Italian speakers, that can be a little intimidating, as can calling a taxi service on your own even if you’re in the comfort of your hotel room. I’d suggest either asking someone at your hotel to arrange a taxi for you, or going to places that are almost always going to have a few taxis waiting for passengers – train stations (Centrale and Cadorna are good options in the city center) or major attractions (such as the Duomo). Note that taxi fares jump in the evenings and at night – that’s not a driver cheating you, that’s the law. Also note that if you call for a taxi, the meter starts running when the driver leaves to come get you, so you’ll see a charge on the meter even before you get in the car. Make sure there’s a working meter before you get in the car, and make sure the driver is using it. Be aware of fixed taxi rates to the airport and other destinations so you know what you’ll be charged. 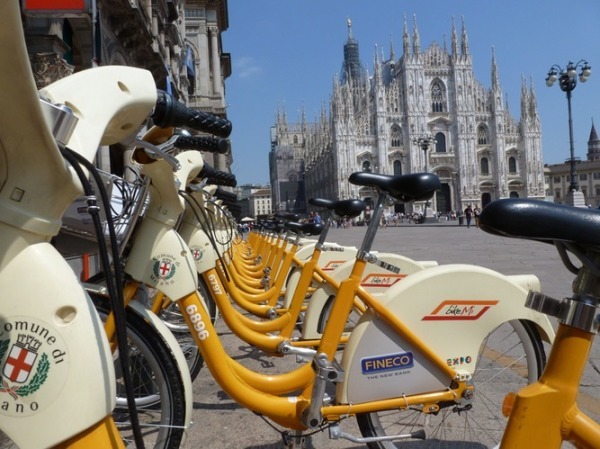 Milan’s bike sharing program, introduced in 2008, is called BikeMi. There are more than 200 stations throughout the city, and although it’s principally used by residents it’s also possible for visitors to use it, too. You can sign up for the BikeMi program here, with subscriptions ranging from one-day (€2.50), one-week (€6), or one-year (€36). Once you register, you’ll get a user code that you’ll put into the BikeMi self-service station in order to unlock a bike. You can use that bike for up to two hours – the first half-hour is free, and you’ll be charged €0.50 for every half hour after that, up to the two-hour limit. After that, you’ll be charged €2 per hour. The good news is that you can return the bike to any other BikeMi station in the city – so it’s really easy to stay within the two-hour limit.